A Vocabulary Management System for the Semantic Web. You can try out iQvoc right now! In our sandbox you can play around with the public views. If you like to test the collaborative functions simply request your personal demo account. 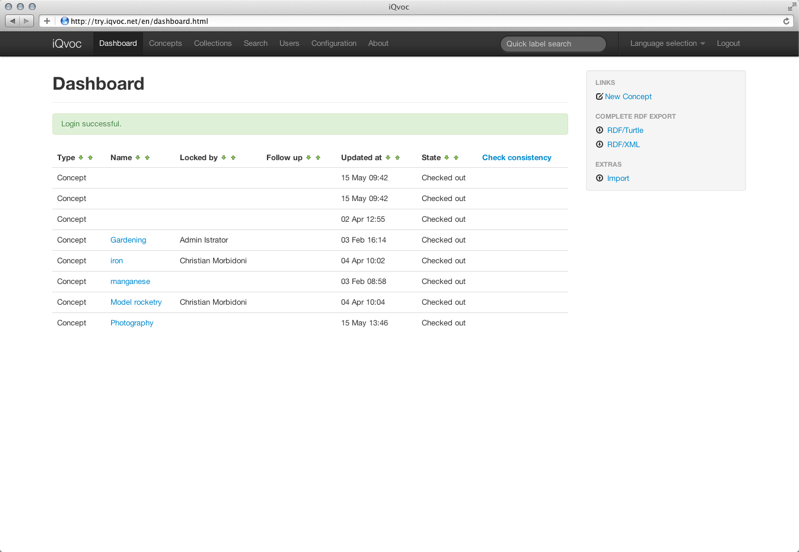 The dashboard serves as starting point for daily collaborative work. 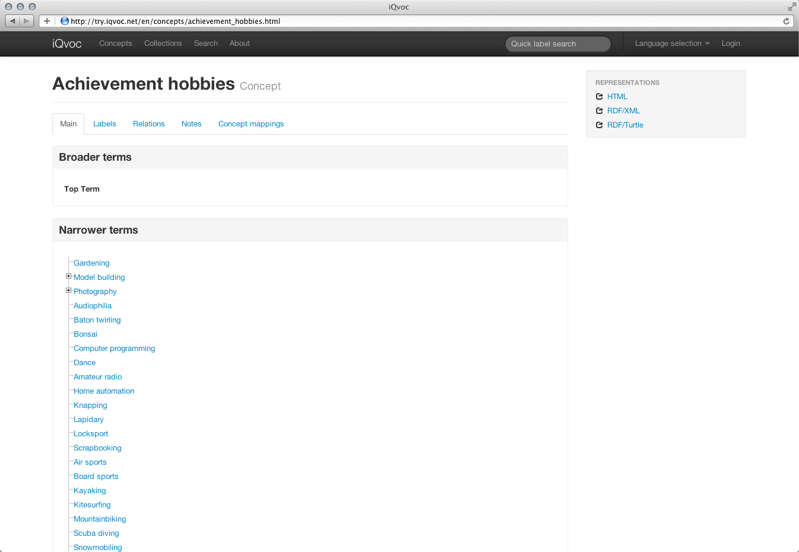 It lists all the current work-in-progress concepts and their respective status. Features What iQvoc can do for you. Existing vocabularies can be imported if they are available in the SKOS format. If there is no such representation, the iQvoc support team can provide help or even do this conversion for you from any kind of available source. If the vocabulary contains extensions by class inheritance, iQvoc can be configured to support this with little effort. Once imported, any vocabulary is ready to be displayed and navigated in an intuitive Web interface. iQvoc supports various customisable skins to align with any kind of user-specific style guide. The iQvoc Web interface provides unrestricted multilingualism and conforms to the guidelines of the Web Accessibility Initiative (WAI). The general vocabulary administrator may authorize registered users as vocabulary editors. Editing is performed in an extension of the original Web interface, so the editorial staff can be globally distributed and there is no need for any kind of additional tooling. You can find the editorial team tutorial here. iQvoc provides unique and stable identifiers for each concept according to W3C guide lines "Cool URIs for the Semantic Web" and "How to publish Linked Data on the Web". There is one URL that represents the abstract concept plus redirections to HTML and RDF "information resources", corresponding to the "accept" settings of the request. This allows, for example, integrating the vocabulary with the Linking Open Data community project or any other conforming knowledge base. Likewise the vocabulary can be referenced in Semantic Annotations for WSDL in order to facilitate a semantically enabled service oriented architecture (SOA). There is a strong emphasis on developing automated semantic matching and annotation methods in the next versions of iQvoc. iQvoc offers a free configuration of URI design in order to provide persistent and sustainable URI references whenever any productive vocabulary is migrated to the iQvoc engine. The Simple Knowledge Organisation System (SKOS) effort is "developing specifications and standards to support the use of knowledge Organization systems (KOS) such as thesauri, classification schemes, subject heading systems and taxonomies within the framework of the Semantic Web" since 2004. iQvoc 1.0 implements the http://www.w3.org/2004/02/skos/core# namespace, which still is referenced by most SKOS applications. iQvoc developers are contributing to the discussion of the upcoming http://www.w3.org/2008/05/skos# namespace, which currently is in W3C Working Draft status. Future versions of iQvoc will support both namespaces. Customization Need a customized instance with extra features? Get in touch with us and send us an email to iqvoc@innoq.com! Technology How we built iQvoc. iQvoc is implemented based on the Ruby on Rails open-source Web framework which allows increased productivity combined with unlimited interoperability of the product. iQvoc can be run with almost any Web server and database management system. If there is a preference for a Java environment, Java byte code is available as well. iQvoc was originally created and is being maintained by innoQ Deutschland GmbH.